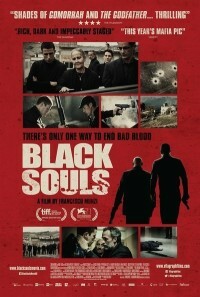 The Italian crime drama, Black Souls, starts out slowly, as it introduces the three main characters, all brothers. Luigi (Marco Leonardi of Cinema Paradiso and Like Water for Chocolate) is involved in the criminal underworld trafficking drugs. His brother, Rocco (Peppino Mazzotta), who lives in Milan, also holds a key position in the mafia. Their brother Luciano (Fabrizio Ferracane), is a shepherd who still lives in the ancestral countryside, and wants nothing to do with the ‘ndrangheta, or Calabrian mafia. After Luciano’s son, Leo (Giuseppe Fumo), shoots up a bar in his hometown, Leo visits his two uncles in the city. Rocco confronts his nephew about the incident, which was against a rival family. Once these relationships are made clear, Black Souls becomes an absorbing story about loyalty, respect, and honor, especially among thieves. Leo’s reckless behavior has prompted a request for an apology. This results in Luigi and Rocco making some compromises that may jeopardize their working relationships with the ‘ndrangheta, not to mention creating difficulties within their own family. Director Francesco Munzi drops viewers into the characters’ lives, and his cool approach to the material allows for tension to be generated during the few “action” scenes. When one character is killed midway through the film, it is not a surprise for the audience (who will likely see it coming). But the ramifications of the character’s untimely death are of interest. Black Souls shows how the various family members respond and react to this tragic event. Leo, in particular wants revenge, and is willing to disobey his father to seek justice. Black Souls is less an action film and more like a character study punctuated by bullets. The leads are all superb, with Ferracane the standout. When Rocco’s wife Valeria (Barbora Bobulova) arrives for the funeral and is kept in the dark about things, her anxiety is palpable. Likewise, the conflicts between Luciano and Leo as well as between the surviving brothers reveal increasingly more details about the true nature of their characters. A shocking ending almost seems out of place with the film’s subdued urgency, but it packs a real punch. Munzi’s film is more intimate and less caustic than other modern mafia dramas, such as Gomorrah, but it is no less gripping. Black Souls opens today at the Ritz Bourse.